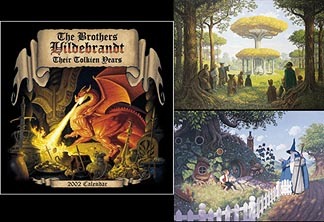 This 3 item set includes one Hildebrandt 2002 Tolkien Years Calendar, a Lothlorien print and a Gandalf Visits Bilbo print, all signed by the artist, Greg Hildebrandt. Millions of fans around the world know and love Greg and Tim Hildebrandt for the original 1977 Star Wars Movie Poster and their J.R.R. Tolkien Lord of the Rings art.